Have you ever felt like something inside of you was missing? Like there is a need that was never met, a message you needed to hear but never heard? Do many of the decisions in your life stem from an instinctual sense of fear, anger, or shame? All of us are driven by certain core desires, fears, and longings that are hard to vocalize. All of us are trying to compensate for messages and needs that weren’t met in childhood. The enneagram is a typology system that is meant to show each of us the roots of many of our driving desires, fears, and coping mechanisms. But What Does the Enneagram Stand For? The enneagram is a geometric figure that maps out nine possible personality types and their complex interrelationships. It is taken from the Greek word “nine”-ennea-and “figure”-grammos; making it a “nine-pointed figure”. The philosophy behind the enneagram has roots in many different religions, from Christianity to Bhuddism to Judaism. That said, the enneagram is not a religion. It’s not a spiritual philosophy (although many religions incorporate enneagram into their studies). Ultimately, the enneagram is about self-knowledge and understanding. It’s about recognizing our core drivers, as well as the impact of our experiences, motivations, attitudes, and fears. According to the theory behind the enneagram, we are born with a dominant type (one of the numbers 1-9). People don’t change types, and the numeral rankings of the types have no significance. A 9 isn’t better than a 1, and a 1 isn’t better than a 9, for example. Scientific validation of the enneagram test, also called the Riso-Hudson Enneagram Type Indicator (RHETI), started in 2004 with a dissertation published by Rebecca Newgent at the University of Akron. She favorably validated the RHETI against well-known five-factor instruments including the NEO-PR-I. The enneagram is used frequently by psychologists and counselors. 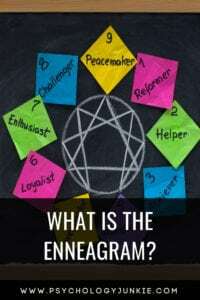 What Are the Nine Enneagram Types? Here are some brief descriptions of the nine enneagram types. We will get into more depth about each of these types in future posts. These types are determined, idealistic, and principled. They are driven by a strong desire to improve the world and root out corruption. They have a strong sense of right and wrong and are extremely hard on themselves when they make a mistake. They tend to be organized, structured, and perfectionistic. Underneath their hard-working, principled nature they are propelled by a sense of anger. However, they feel like they must suppress their instincts and anger in favor of what is right and good. These types are devoted, giving, and self-sacrificing. They tend to be generous and warm and are frequently aware of the needs and emotional dynamics of others. They want to feel needed, to take care of people, and to feel a sense of camaraderie and affection with others. They may struggle to take care of their own needs because they become so consumed with taking care of others. They tend to suppress anger, looking outside themselves for affirmation and value. They tend to reject their true feelings in order to feel, and be see, as entirely loving. Threes are motivated by success and accomplishment. They are competitive, charming, adaptable, and ambitious. Achievers want to gain status and personal advancement and are usually good at presenting themselves well. They want to distinguish themselves from others by mastering their strengths and abilities. They strive to be the best they can be, but this can lead to workaholism and chronic dissatisfaction with where they are now. They tend to suppress their feelings in order to make a favorable impression on others or be more effective. Fours are sensitive, self-aware, creative, and often quiet. They believe in being emotionally honest and true to their values and beliefs. They tend to withhold part of themselves from others and often feel misunderstood. They hate the idea of being ordinary, yet they sometimes become jealous of ordinary life. They spend much of their time invested in their internal mental landscape. They often have rich imaginary worlds that they long to express either through art or lifestyle choices. They tend to under-express feeling, showing it indirectly through art or aesthetic living. Fives are skeptical, curious, innovative, and independent. They like to be wrapped up in ideas and theories and enjoy discovering new insights. They tend to appear detached yet intense and can veer towards isolation, nihilism, and eccentricity. They tend to look at things from new perspectives and see the world in unique and original ways. Fives tend to over-express thinking; substituting thinking for action or doing. They may become obsessed with complex thoughts and struggle to bring any of their ideas into fruition. Sixes are responsible, skeptical, security-oriented types. They tend to be hard-working and cautious, always trying to create a safer and more secure future. Some do this by seeking community and adhering to traditions while others eschew community and tradition because they feel like they can’t trust it. Sixes tend to feel that they can’t truly hold onto anything or take anything for granted, so they seek some kind of security that always seems to be evading them. They tend to have a deeply-rooted sense of fear at the center of their personality which can cause them to become evasive, anxious, and suspicious. However, when they are healthy they can be deeply insightful, protective, and generous. Sevens are energetic, enthusiastic, spontaneous personality types. They are usually driven by a sense of adventure and playfulness. They desire to make the most of each moment and experience new things. They are usually busy and active, trying to keep themselves occupied with as many possibilities as possible. Their impulsive, fun-loving nature usually puts them at the center of many social events. When they’re not mature, they can be scattered and attention-seeking. Sevens tend to under-express thinking; leaving their train of thought incomplete or getting distracted by new thoughts and activities on a regular basis. Eights are self-confident, assertive, and protective personality types. They are determined not to be controlled by others and they put their trust in their instincts. They want to get the most out of life and they hate being in positions of subservience. As a result, they are often drawn to running their own businesses or working independently. They want complete self-reliance and they can sometimes feel like ‘outlaws’ in a world full of rule-followers. Eights tend to over-express instinct – they move on hunches and reactions and can do so without stopping to see the consequences. Nines are easy-going, supportive, and conscientious people who are skilled at creating harmony wherever they go. They seek stable lives and enjoy simple pleasures. They are usually affable and friendly and are unlikely to attempt to control others. They have a strong faith that everything will work out and they approach life with an easy optimism that many are drawn to. Nines tend to deny their anger and instincts because they feel threatened by them. They tend to avoid dwelling on any negative feelings and emotions, instead preferring to focus on their relationships and their immediate environment. The nine enneagram types are arranged in three sets of three. Each set of three has a center. Five, six, and seven form the thinking center. Eight, nine, and one form the instinctive center. Two, three, and four form the feeling center. The inclusion of each type into it’s center is not arbitrary. Each individual has a unique relationship and set of issues related to their center. For example, 1’s under-express instinct, 8’s over-express instinct, and 9’s are the most out of touch with instinct. The centers are also important in that they show us one of the strongest unconscious drivers of each of the personality types. In the instinct group, the core emotion is anger or rage. In the thinking group, the core emotion is fear, and in the feeling group the core emotion is shame. While all 9 personalities have access to all three emotions (anger, fear, shame), each group of three is profoundly affected by their core emotional theme. There is a lot more to the enneagram than what is in this initial post. There are wings, tritypes, directions of integration and disintegration, and more. The enneagram can tell you the reasons why you make a lot of the decisions that you do, and it can show you how you behave when you’re spiraling out of control, as well as your tendencies when you are mature and well-developed. I will be writing more about the enneagram in the future so stay tuned for more posts on the subject! How Can I Find Out My Enneagram Type? There are quite a few knock-off enneagram tests available online, but like all knock-off tests, they are highly unlikely to be accurate. You can take the official enneagram test here. You can also find your type by studying the enneagram personally. My favorite book to reference is The Wisdom of the Enneagram (this is an affiliate link). I will also be including more enneagram articles on my site in the coming weeks! This is an area of typology that I think can be extremely beneficial to everyone. Do you love or hate the enneagram typology system? Do you have any questions about it? Let us know in the comments! I’d be interested to find out your type! The test that the link takes you to cost $12. Here is a link to a free test that I have personally used, and my aunt (who is a counselor) had used and we have both found it to be remarkably accurate. I know that tests that aren’t the official test aren’t always accurate because they aren’t laid on the correct foundation or they are biased though I can’t inform as to what those problems and biases would be. If you do use this test, it does not have a description of the types, but the link in this article does have descriptions, and i highly recommend those. As an infp, I find the enneagram to be a deeply insightful tool for personal growth and development. While I am no expert, I do enjoy listening to podcasts and reading about the enneagram. I appreciate that the enneagram system lends itself to deeper contemplation and is described as more of a journey of self discovery. This system is almost a deconstruction of the false self created out of ego defense mechanisms and core passions. It also provides a path for psychological growth and spiritual growth. So, to answer the question, I like it and find it useful! Just when I thought your blog couldn’t get more awesome, you go and write this. Thank you! And I can’t wait to see your future posts about this! Perfect! I wanted to move on from Myers-Briggs and just started looking into the enneagram a couple of weeks ago! I’m so excited for the upcoming articles! I believe I’m a 4w5, but not quite sure. I love how Myers Briggs is about cognitive processes while the Enneagram is about deep motivations caused by fears and desires. It seems I am in the minority opinion here, but I’m not a big fan of the Enneagram. I like the MBTI because it provides a structure based in actual psychological principles and observation. I’ve found it especially handy in understanding the people who sometimes seem so extremely different from ourselves that they feel alien… MBTI provides good concrete explanations that explain those differences while still emphasizing that we are all humans and all deserving of respect and understanding. However, I don’t get that feeling from the Enneagram. The biggest reason is that I distrust the mysticism that underpins the whole theory… it feels a bit like putting the horse ahead of the cart, a circular argument where you’re arguing a point by citing your point itself as evidence. The theory feels entirely self-contained in a way that you can get really deep into the study of it without ever having to check it against factual or concrete evidence, and to me, it seems there’s something really dangerous about that. Whoops, I meant putting the cart before the horse. INFJ and 9. I’m also an MBTI practitioner and student of enneagram. I whole-heartedly agree with the way you’ve described the two personality tools. Truth is – there are other, even yet unknown ways to look at personality – but I appreciate what these two offer. Enneagram is a super useful tool to help explore fears, anxieties and woundedness that might go otherwise unnoticed. I so appreciate the way it unveils the darkness that lies deeper inside, and helps us find our journey towards wholeness. I appreciate MBTI because it provides the solid framework with which we process life and relate with others. Heya, like Anne above, I also give virtually no credence to the Enneagram typing, both for all of the reasons that Anne stated, but also because from what I have learnt about the system, the “theory” seems way too loose to contain any value. i.e. you have 9 types arranged in a circle, besides your “main type”, you somehow have also have the types to either side of that main type around the circle, and you also have two other types you go to, one under stress and another under a feeling of safety. That makes a total of 5 types out of 9 that the “theory” says you fit into. When a “theory” says that you should fit into more than half the categories (which makes it more likely than not that any type you look at you will feel an identity with) it sets off very loud alarm bells in my head telling me to treat it with a high degree of scepticism. That said, I think it can act as an introspective tool, like tarot or astrology and in much the same way as the placebo effect in medicine, its not what it does, but what it helps you to do for yourself so long as you don’t put too much credence in it and from personal experiences with friends, things like tarot can become dangerous if you put too much faith into nothingness, especially if you have a tendency to imagine sinister possibilities and thus read this into the nothingness. Anyway, just some thoughts, I would love to hear your feedback and whether I have myself mistaken on what I have learnt of the enneagram. I really like the enneagram components of fears, desires, integration, and disintegration. As a 9, I strongly relate to going to 6 in times of stress. Can’t wait to see more enneagram posts.